Video Player All Format is a professional video playback tool. It supports ALL video formats, 4K/ultra HD video files, and plays them with high-definition. Video player is the best video app to play music & video. It is simple operation, quick start, smooth playback. It supports all types of video format and audio format. 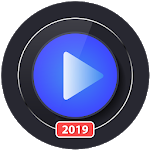 Video player can plays all ultra high definition video (HD video, 4k video) files too. Equalizer features can helps you to make your audio playing super cool. 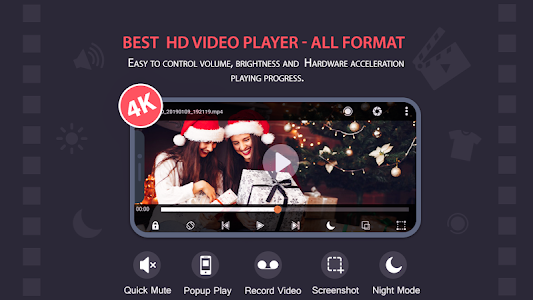 # Unique Full hd Video Player App. # Best 4K Video Player. # Small installation size less than 3MB. # Smooth Scrolling over list of Videos. # Can play Videos and Audios in background. # Can play 4k ultra hd Video 2160p depending on the hardware. # Play all formats: AVI, MP3, WAV, MP4, WMV, 3GP, M4V, MKV, Rm, TS, MPG, and FLV. # Search media item in specific folder of whole device. # List + Grid view. # Gesture Controls to change Volume, Brightness, seek media smoothly. # Identify all video files on your device and SD Card automatically. # Manage or share videos easily. # Play files in background. # Displays Videos and Audios in Specific Folders. # Delete Multiple Videos at the same time. # Share Video on Social Forums. # View Details about a video and audio. # Support ALL video formats, including MKV, MP4, M4V, AVI, MOV, 3GP, FLV, WMV, RMVB, TS etc. # Ultra HD video player, support 4K. # Keep your video safe with private folder. # Cast videos to TV with Chromecast. # Support subtitle downloader and more. 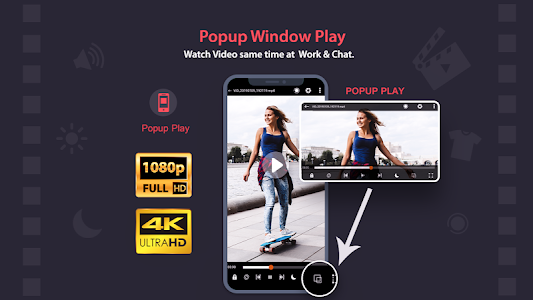 # Play video in pop-up window, split screen or background. # Night Mode, Quick Mute & Playback Speed. 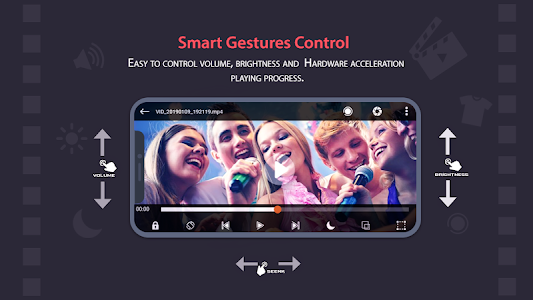 # Easy to control volume, brightness and playing progress. # Multi playback option: auto-rotation, aspect-ratio, screen-lock etc. # Video player hd for both android tablet and android phone. Similar to "Video Player All Format"